Reading time – 2:58; Viewing time – 4:31 . . . I used to think of myself as a Republican – an Eisenhower Republican. At this point, though, I don’t know what it means to be a Republican. Or a conservative. It seems that extreme-ism is the battle cry of the 21st century and now the Republican Party is casting off any semblance of moderation and even simple respect for opposing views. Ronald Reagan told us he was a true conservative. He believed in small government and low taxes. Then he bloated the federal government and raised taxes six times. What’s conservative about that? David Stockman was Reagan’s Director of the Office of Management and Budget, who famously declared in an interview for The Atlantic entitled “The Education of David Stockman,” that, “I mean, Kemp-Roth [Reagan’s 1981 tax cut] was always a Trojan horse to bring down the top rate…. It’s kind of hard to sell ‘trickle down.’ So the supply-side formula was the only way to get a tax policy that was really ‘trickle down. '” In other words, trickle-down was a ruse to get tax cuts for rich people. That dishonesty created decades of stagnation for middle class and working people. What’s conservative about that? George W. Bush started two avoidable wars against countries that did us no harm. Then, instead of raising the taxes needed to pay for his wars like every other war president in American history, he drastically reduced taxes, which assured massive debt in the trillions of dollars. What’s conservative about that? Then the Tea Partiers came and shut down our government to prevent the raising of the national debt limit. The debt limit was and is about authorizing the issuing of debt instruments so that we can pay for what we’ve already purchased – essentially it’s about keeping our word to pay our bills. The Tea Partiers – Republicans all – tried to make us into a dead beat nation. What is conservative about that? Restrictive voting laws have been enacted in many states to prevent our almost non-existent voter fraud. The effect of these laws is to prevent tens – perhaps hundreds – of thousands of legal voters from voting. That’s anti-Constitutional, so what is conservative about that? Kris Kobach, the face of dishonest voter fraud claims. Now Kris Kobach, the former flame-throwing Secretary of State of Kansas who made his bones by railing against non-existent voter fraud, is heading a commission – a fraudulent commission (also here and here). He and his band of liars and thieves are trying to institutionalize voter suppression, this from the federal level. Be clear that this is yet another Republican Trojan horse, in that the real purpose of the Kobach Commission is to extend the last gasp of control for a vanishing white majority. What’s conservative about the pernicious lies of these lying liars (thank you, Al Franken, for the descriptive words)? What’s conservative about stripping voting rights from the young, the old, the poor and those of color? The Republican Party has verbally championed conservatism, but it seems to want to conserve the kinds of things that are at odds with anything that is conservative or even patriotic. Whatever happened to loyalty and justice and the rule of law, the kinds of things that Republicans used to want to conserve? They keep telling us that they’re the party of Lincoln, but they do things that Lincoln would have found both abhorrent and illegal. Charlie Christ, former Republican governor of Florida, switched parties, declaring that he didn’t leave the Republican Party; rather, the Republican Party left him. He’s right. So are all the other former Republicans, like Rep. Patrick Murphy (now D-FL) and those who threw up their hands in disgust and quit, like former Sen. Richard Lugar (R-IN). Perhaps today’s Republican Party needs a new name: The Un-Repubican Party. Wait, though. We the People keep electing these extremists, so, sadly, we’re getting what we deserve. Perhaps we have to wake up and smell the Constitution. Otherwise, we can start calling ourselves We the Un-People. Reading time – 1:47; Viewing time – 3:45 . . . NOTE: WordPress is the utility I use to craft and offer these posts and it has gone mad. It is misbehaving in strange and limiting ways, which accounts for why this post is late, why there isn’t much in the way of pics in this offering, as well as why there may be typos, irregularities and writing that looks like something from my iPhone, whic h often prints whatever comes into its silicon brain. 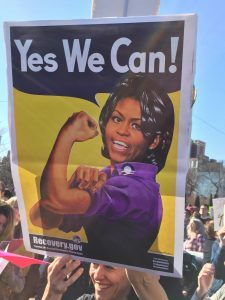 We were proud and humbled to participate in the Women’s March in Chicago on January 21, along with 250,000 others locally (they had been expecting just 20,000) and 3,500,000 people around the world. It’s curious that so many non-Americans were so interested – invested, really – that they would give up a day to demonstrate over what is happening here. There are reasons why so many demonstrated, so get this: We must stand up and be counted. Then we must do it again. And again and again. We must make our voices heard. Our elected officials must feel the hot breath of our collective voices so that they ignore us at the peril of loss of their jobs. Get this, too: This (the marches) is what democracy looks like when people see tyranny on the way. 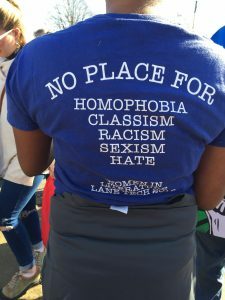 Look for more pictures of the Chicago march as soon as WordPress fully comes to its senses. On to today’s (Sunday’s, really) opinion piece. In Eliyahu Goldratt’s book The Goal the author depicts a troop of Boy Scouts on a long march. One of the boys – Herbie – is overweight and soon has to slow down, unable to keep up with the rest of the boys. Given that the boys must stay together, the entire troop can march no faster than the speed which Herbie can maintain. That is to say, Herbie is the primary constraint for the troop of Boy Scouts that precludes completing their march and going for a swim sooner. 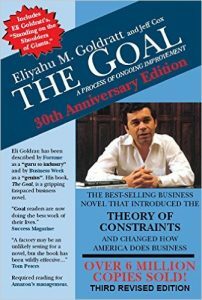 Thus, Goldratt introduces the Theory of Constraints. It’s a most useful scientific approach to problem solving, finding root causes and optimum solutions, strategic planning and more based upon identifying and dealing with the lowest performing factor. And, entertainingly, analysis and planning can be done with a pen, a pad of sticky notes and a wall. I participated in a two week course to learn to do this kind of analysis along with a half-dozen colleagues several years ago and came away with an elegant plan for my business and several profound revelations, one of which is that I’m more of a big picture guy and not so much a detail guy. That was both useful and painful to realize. Nevertheless, I learned that whatever the endeavor, there is always a Herbie, a constraint that prohibits further improvement and it is the pinch point that must be dealt with first if things are to get better. That leads me to wonder what our national Herbie is right now. You may be tempted to say it’s Donald Trump, but that might be both of little value and factually incorrect, because something put Donald Trump into the White House. Something created the political polarization in which we live and something created the problems we refuse to deal with. It is the key challenge to us in moving forward. If you agree that we are well short of where we could and should be, I offer this question to you: What is our national Herbie? What is the key constraint that prevents us from having a healthy democracy? Give this some thought and pen your ideas in the Comments section below. The word “Anschluss” became well known in 1936 as Hitler’s Germany annexed Austria. Two years later the next newly familiar name was the Sudetenland, the predominantly German speaking part of Czechoslovakia. Hitler’s pact with England’s Prime Minister Neville Chamberlain paved the way for the rest of Czechoslovakia to fall into German hands and in 1939 Poland fell to the Nazis in just a few days. Then in 1940 Hitler incrementally overran Denmark, Norway, France, Belgium, the Netherlands, Luxembourg and it wasn’t looking too good for the Brits at that point. All this took place with the world pretty much watching from the sidelines as though people expected something different to happen after each country fell to the German blitzkrieg (another word that became well known then). On September 8, 1974 newly ascended President Gerald Ford issued a “full, free and absolute pardon” for “ . . . all offenses against the United States which he, Richard Nixon, has committed or may have committed or taken part in . . . ” Many were the conspiracy theories about a supposed pact with the devil that spawned a Ford presidency and a pardon for an American who had not yet even been indicted for a crime but whose guilt was obvious. Nevertheless, the pardon stood and, other than having to resign from office, Nixon got away with his lawbreaking. 1985 was a fine year for labyrinthine presidential dealing, as President Reagan and his team negotiated a three-way swap of arms to Iranians and sent money from the arms transactions to the Contras in Nicaragua. The arms going to the Iranians were supposed to buy goodwill, such that the Iranian government would exert influence to get 7 American hostages released from their imprisonment at the hands of the Army of the Guardians of the Iranian Revolution (Hezbollah). The U.S. sale of arms to the Iranians was a violation of the then-current arms embargo on Iran. Providing money to the Contras in Nicaragua was in direct violation of the Boland Amendment. Interestingly, of those indicted for their parts in this nefarious scheme, a handful received a sentence of a short term on parole. A few went to prison for a little while and of those, nearly all were pardoned by President George H. W. Bush, himself a key player in the conspiracy but who never had to answer for his lawbreaking. President Reagan was clearly responsible for the entire illegal operation but he was never charged with anything other than poor oversight of his national security team. That is to say, he got away with it. In the waning days of George W. Bush’s second term the major U.S. financial institutions began to fail under the weight of the house of cards they themselves had allowed to be erected and Bush told us we had to act immediately to rescue them because they were “too big to fail.” We sent trillions of dollars their way and, even as fraud had plainly been committed, no criminal indictments were issued against the perps. Those same financial institutions are now far larger than they were when they were “too big to fail” and their smoke-and-mirrors investment schemes continue. Bush also lied the U.S. into two wars and compounded his lawlessness by authorizing the torture of hundreds of prisoners, an act that is in violation of the Geneva Conventions and others, as well as a clear violation of United States law. Not a single person involved in that lawbreaking was indicted for anything and the Obama administration has made clear that it will not prosecute. All of the lawbreakers have gotten away with their crimes. There is an ongoing pattern of crime at the highest levels that continues to go unpunished. What is significant about that is the certainty that bad behavior unpunished is a guarantee of more bad behavior in the future and that is exactly what has happened. Let’s take this knowledge to the present crisis. 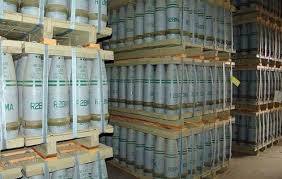 It is clear that Bashar al-Assad has no compunction about killing over 100,000 of his countrymen, nor has he any concern over using weapons of mass destruction, like sarin gas (stockpiles pictured above). Failing to punish that behavior will ensure that Bashar al-Assad will do more of the same or worse in the days to come. And the story is even bigger than that. We are facing an upcoming nuclear arms threat from Iran. So, too, and likely more immediately, is Israel facing that threat, given that the Iranians have sworn to wipe Israel from the map. We have told the Iranians that they must abandon their development of nuclear weapons and comply with international agreements to halt the spread of nuclear weapons. We have been clear that failure on their part to comply will be seen as a threat to the United States, which will compel us to take direct action against that threat. But are our threats of action against Iran believable if we fail to confront the use of weapons of mass destruction in Syria? The world sat on its hands as Hitler incrementally annexed most of Europe. In the United States we allowed Richard Nixon, Gerald Ford, George H.W. Bush, George W. Bush and Barack Obama to break major laws with impunity or fail to prosecute those who did. Each of those then-current issues and failures to act ensured the next wrongdoing. The pattern and the message are unmistakable: The behavior we tolerate is the behavior we are certain to get over and over. But now the toleration of bad behavior could lead to worldwide catastrophe. In preparation for entering her freshman year in college, my daughter and her contemporaries were urged to read Going After Cacciato, by Tim O’Brien, and to arrive on campus prepared to explore the book in discussion groups just prior to the start of classes. Cacciato is an exploration of experiences of the Vietnam war, of both fear and the heroism of the human spirit. As I recall, she didn’t much care for the book, but I read it and found it enormously inspirational, perhaps even transformational. It is, in part, about coming of age, of fulfilling the destiny of our dreams. We as a nation sorely need a message of destiny fulfilling, of coming of age right now. To that point, have a look at this excerpt from the book. It is easy, of course, to fear happiness. There is often complacency in the acceptance of misery. We fear parting from our familiar roles. We fear the consequences of such a parting. We fear happiness because we fear failure. But we must overcome these fears. We must be brave. It is one thing to speculate about what might be. It is quite another to act in behalf of our dreams, to treat them as objectives that are achievable and worth achieving. It is one thing to run from unhappiness; it is another to take action to realize those qualities of dignity and well-being that are the true standards of the human spirit. I am asking for a positive commitment. Live now the dreams you have dreamed. Be happy. It is possible. It is within reach of a single decision. This is not a plea for placidness of mind or feebleness of spirit. It is a plea for the opposite. For just as happiness is more than the absence of sadness, so is peace infinitely more than the absence of war. Even the refugee must do more than flee. He must arrive. He must return at last to a world as it is, however much in conflict with his hopes, and he must then do what he can to edge reality toward what he has dreamed, to change what he can change, to go beyond the wish or the fantasy. “We had fed the heart on fantasies,” said the poet, “the heart’s grown brutal from the fare.” I urge you to step boldly into it, to join your dream and to live it. Do not be deceived by false obligation. You are obliged, by all that is just and good, to pursue only the felicity that you yourself have imagined. Do not let fear stop you. Do not be frightened by ridicule or censure or embarrassment, do not fear name-calling, do not fear the scorn of others. For what is true obligation? 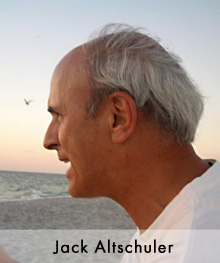 Is it not the obligation to pursue a life at peace with itself? You have come far. The journey has been dangerous. You have taken many risks. You have been brave beyond your wildest expectations. And now it is time for a final act of courage. I urge you: March proudly into your own dream. What is your dream for yourself and for America? What is your vision for the country you want to bequeath to your children, your grandchildren and all of our grandchildren? What is the dreamed-of soul of Cacciato as metaphor for America? It is within reach of a single decision right now and we can make it come of age.